By J. S. BROWN; From The Magazine ANTIQUES, July 1978. Skippets are small boxes made to hold and protect pendent wax seals attached to important documents. Silver, silver-gilt, and gold examples were used by the United States government between 1815 and 1871, primarily on treaties with other countries that had been ratified by Congress. The skippet was suspended from the treaty by woven strands of gold or silver, often entwined with strands of silk, which had been threaded through the box before the hot wax was poured in. The wax was impressed with the great seal of the United States, and the cover of the box was hand chased with a design based on the seal. The first skippet made for the United States government was for the Treaty of Ghent, which settled the War of 1812 with England. Now in the Hall of Records in London, it is marked by the Georgetown silversmith Charles A. Burnett. His shop on Bridge Street was not far from the bookshop and bindery of Joseph Milligan, to whom the State Department paid $60 on March 13, 1815, for a “Portfolio of green velvet, lined with orange silk, tied with red, white, blue and yellow ribband-Gold Cord and Tassels, with Silver Box and Seal appendant.” Obviously Milligan subcontracted the fashioning of the box to his neighbor Burnett. Fig.1- Silver-gilt skippet attached to the Convention of Adjustment of Claims with Mexico, ratified February 8, 1839. Diameter 5 1/8 inches. It is attached to the plain navy blue silk velvet portfolio by cords of gold thread and dark blue silk. Unperfected Treaty File, Diplomatic Division, National Archives, Washington, D.C.; photographs are by Helga Photo Studio. Milligan received other orders for treaty portfolios with pendant seals, but he was not the only person supplying skippets at the time. On April 1, 1819, Jacob Leonard, a Georgetown silversmith, was paid “$35.00 each for four silver-gilt and engraved treaty boxes”; and Seraphim Masi, a Washington D.C., jeweler, silversmith, and watchmaker, received $240 for “four Seal Boxes for Treaties” on June 5, 1824. The government generally seems to have ordered a number of skippets at a time, presumably in order to have them on hand when needed. The skippet on the Treaty of Ghent and one suspended from an 1822 treaty with Great Britain enclose wax seals impressed with a great seal of the United States which measures approximately two-and-one-half inches in diameter. That die was used to impress water seals from 1782 until 1841 and pendent seals from 1782 until 1825. 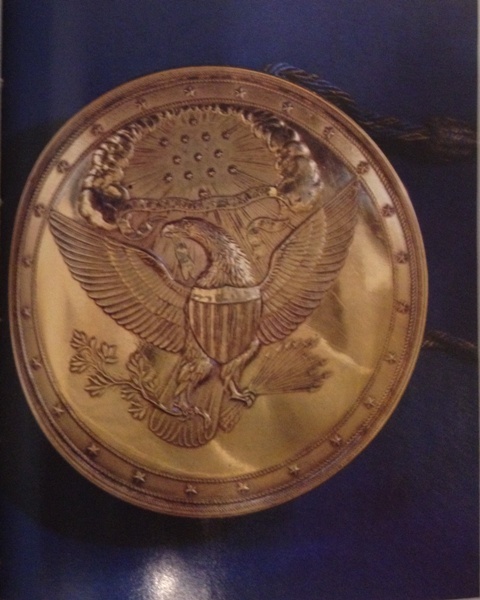 However, on May 5, 1825, Masi was paid $100 for a “great Seal for the U.S.” The die, four-and-eleven-sixteenths inches in diameter, is known as the Old Treaty Seal of the United States, and it was used on all pendent seals until 1871. The seal shown on the cover, for example, is marked with this die. It is inside the skippet appended to an extradition treaty with the Netherlands that was signed at The Hague on May 29, 1856, ratified by Congress, and signed by Franklin Pierce, but never sent to Holland. Masi made a number of skippets for the government. The last he is recorded to have made accompanied Commodore Matthew C. Perry on his expedition to the Orient between 1852 and 1854. Perry carried with him a letter from President Millard Fillmore to the emperor of Japan and a letter of credence which empowered him to negotiate a treaty with Japan. According to Perry’s report, the letters, “of folio size, were beautifully written on vellum, and not folded, but bound in blue silk velvet. Each seal, attached by cords of interwoven gold and silk with pendant gold tassels, was encased in a circular box six inches in diameter and three in depth, wrought of pure gold. Each of these documents together with its seal, was placed in a box of rosewood about a foot long, with lock, hinges, and mountings, all of gold. The payment to Masi of $1,827 on July 23, 1852, included the cost of the rosewood boxes as well as the skippets. Perry signed a treaty with Japan on March 31, 1854. Samuel Lewis, a Washington silversmith and clockmaker, made the gold skippet used on the ratified treaty, for which he was paid $1,220.52 on August 25. He continued to make skippets until 1870, when he received the last payment made for a skippet by the United States government. Fig. 3- Silver skippet attached to the Convention of Transit Way Across the Isthmus of Tehuantepec with Mexico. Diameter 5 1/8 inches. The treaty was signed in Mexico City on January 25, 1851, by the Mexican and American plenipotentiaries. President Millard Fillmore and Secretary of State Daniel Webster signed it on March 11, 1851. The skippet is suspended by silver cords from the velvet portfolio, which is embossed with an adaptation of the seal of the United States. Unperfected Treaty File. The United States skippets illustrated here and on the cover are three of the five remaining in this country that are still attached to their treaties. Each is attached to a treaty ratified by Congress and signed by the contemporaneous president and secretary of state, but for various reasons the exchange of ratification was never completed.